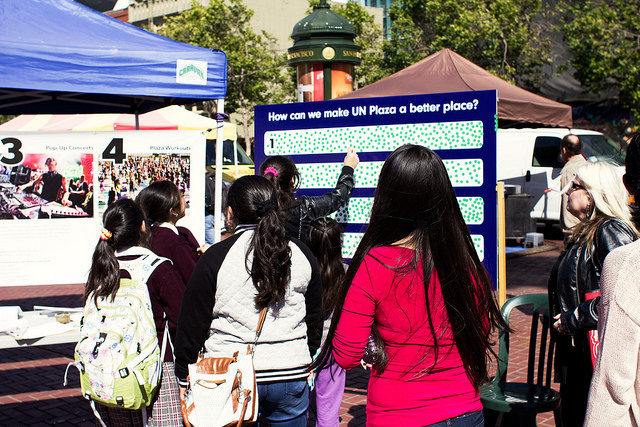 We are excited to share with you the results of our UN Plaza Idea Contest. With 873 total votes (813 in person, 60 online) during our June 4 idea election the Heart of the City Farmer’s Market. Thank you for your support in turning out to vote! Special thanks to Heart of the City Farmers Market, Hastings University, Neighborland, OEWD, and all who voted! View our Flickr page to see photos from the event. Read more about this project. If you’d like to stay connected with us on other issues, or other channels, you’ll find us typing on: e-news, Facebook, Instagram, or Twitter.